An essay is a short piece of writing that tells a story (a narrative essay), argues for or against something (a persuasive essay) or gives information. Cause and effect essays can be organized in two main ways. Authors can discuss all the consequences that follow from one cause, or they can identify the multiple causes behind an event. 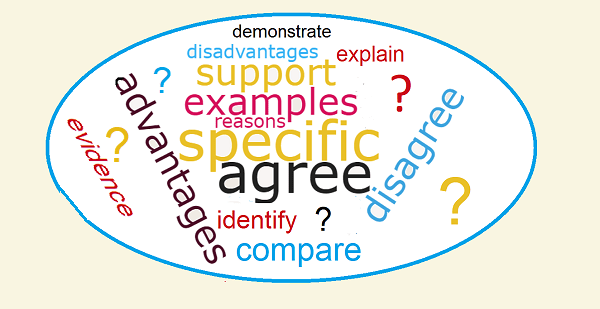 Authors of persuasive essays especially need to provide clear evidence to support (back up) each claim they make. They also need to consider the arguments the opposing side will make, so that they can point out any faults in the reasoning or show why their own arguments are better. All English essays are organized into paragraphs-- groups of sentences with one main idea. In handwritten essays, paragraphs are usually indented: each new paragraph is started several spaces in from the left margin. Typed or printed essays, articles, and books are often not indented, but there is an extra blank line between paragraphs, to make the essay or article easier to read. The next paragraphs offer evidence and examples to support the main idea, and the last paragraph is a conclusion, summarizing the evidence and restating the thesis. Every paragraph has a topic sentence which states the main idea of the paragraph. (It is often the first sentence.) The rest of the sentences offer specific details and examples to explain, illustrate, and support the main idea. Transition words like and, but, or, however, although, because, since, next, then, and finally connect ideas and show the relationships between thoughts in a paragraph and between paragraphs. The final paragraph of an essay summarizes its ideas or arguments and states a conclusion. It should emphasize the points the author most wants the reader to remember. Do you understand these essay prompts? If you are unsure about the differences between 'explain,' 'illustrate,' and 'demonstrate,' or any of the other words above, check it out. It's important to understand what the test examiners expect! See Academic Writing for the process of researching and writing an essay, and TOEFL or IELTS Essay Sample or the end of Transition Words for essay examples. 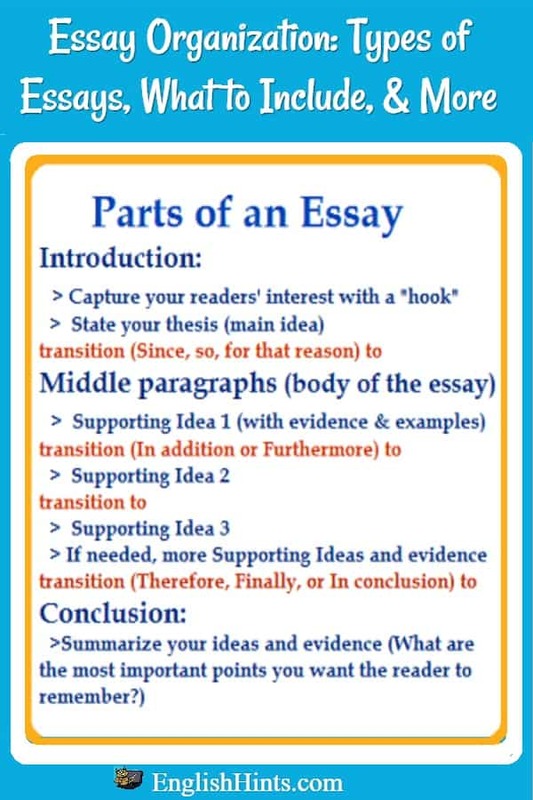 English Essay Writing Practice has practical suggestions on expectations for English essays, plus inexpensive step-by-step help if you need to practice for an important test that includes an essay. Once the first draft of the essay is written, see the Revision and Proofreading Checklist for help in revising it to make it clearer and better and then proofreading it to find and correct mistakes. Home> ESL Writing> Essay Organization. 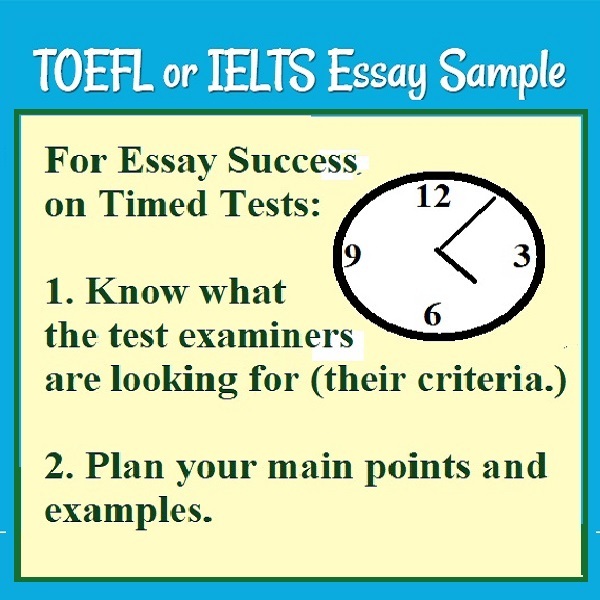 Tips for TOEFL or IELTS essays and a sample essay to demonstrate best practices.